We’ll post video later today of Phil’s speech, which provided a pretty thorough overview of efforts underway in many Metro departments, along with many agency goals. “We are on the verge of becoming the infrastructure capitol of the world,” Phil said, highlighting the importance of the work ahead. Below is the presentation that accompanied Phil’s remarks. I encourage you to scroll through it — you’ll probably find something interesting. 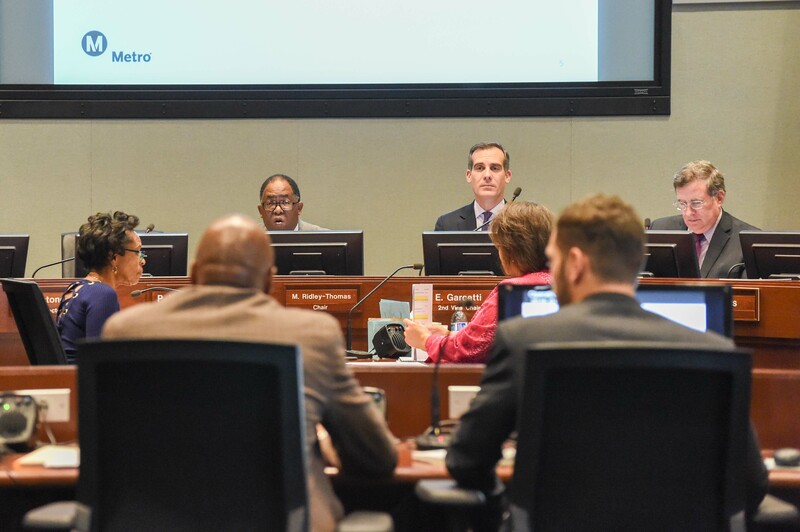 LA Metro CEO Phillip Washington today delivered his first annual State of the Agency report to the Los Angeles County Metropolitan Transportation Authority (Metro) Board of Directors calling the agency sound, with many challenges ahead. However, Washington said those challenges are being addressed and the many opportunities that lie ahead of the agency are achievable. Metro Board Chair and Supervisor Mark Ridley-Thomas, left, and Board Member and L.A. Mayor Eric Garcetti listen to Washington’s remarks on Thursday. On the issue of declining ridership, Washington noted that ridership is down nationally but that’s not unexpected given its cyclical nature. LA Metro is taking a long term view and looking at a 30-year planning horizon. It was noted that an additional 750,000 people are forecast to relocate to LA County in the next decade. LA Metro created a Ridership Task Force last year to study the ridership decline issue, both in LA County and nationally. Metro is now looking to speed up and optimize bus service across the system and is in the midst of using technology to enhance the ridership experience to attract riders. I wish people would look closely at the “risk allocation matrix” which calls for reduction of costs by 1% through unspecified “efficiencies” (which will generally reduce the robustness and reliability of the system, like cutting extra board operators or reducing layover times) and, more specifically, gives the CEO authority to cut night rail service to 20 minute headways after 8 PM and replace trains with buses after midnight, as well as creating a shortline terminal at Reseda on the Orange Line and reducing service west of that point to Chatsworth. Some of the ideas are unpractical, like blasting audio ads at customers (which provide less benefit than the ad-supported Transit TV) or wrapping LRT vehicles with ads. It’s fine for the CEO to cheerlead this idea but there needs to be full disclosure on what it entails. I’m very interested and excited to see and hear more about Operation Shovel Ready! I am sincerely impressed with the job that Mr. Washington has done so far. With declining ridership will he reign in the bloat in staff at mta’s marble tower? If the MTA truly wanted to improve service they would take every currently serviceable bus out of storage plus refurbish those buses, some of which only need new CNG fuel tanks, that were slated to be sold and place them back in service. If the federal mandate is still in effect concerning the feds requirement of not increasing the fleet but only replace buses using federal funds then create a dummy corporation(operating agency) and replace all the new or near new buses assigned to the MTA contractors with those buses slated for sale. A dummy corporation is nothing new at the MTA. Non contract employees have worked for the Public Transit Service Corporation since the founding of the MTA. The reason for this dummy corporation is to circumvent the Federal governments requirement that they take part in the Social Security program. Non contract do not as well as one or two contract employee groups are classified as PTSC employees exempt from S.S. while Bus Operators and Mechanics for instance are considered MTA employees and are in the S.S. program. I can see the benefit of subcontracts just like Line 205 that runs with the diesel buses. It may not make financial sense to put in new CNG tanks for buses that are already 15 years old. What is practical is Metro can fully staff the mechanics during the night hours so that EVERY BUS can be used either in revenue service or as a bus bridge. What bothers me is that I see too many buses that sitting at or near the repair shops during peak hours. Metro can make the buses to operate two tanks of CNG per day instead of one tank. Access Services ( http://accessla.org/home/ ) is using this scheduling method. If the buses are driven twice the mileage than they are currently scheduled for, then it will make more financial sense to replace new CNG equipment when the buses are at the 8th year of service. I hope that with the opening of the new Division 13, all the buses will be in the state of good repair so that they can be driven more than they used to. If Metro wants to improve ridership, it should learn a thing or two from Facebook. If Facebook can provide routing support to people who are going to major events, then Why can’t Metro borrow a page out of Facebook’s playbook by providing similar services (personalized routing assistance) for people who are going to the Metro sponsored events? If Metro cannot develop a similar software to provide personalize services, maybe Metro should obtain licenses to use Facebook’s patents for such services. Metro should try to connect more Rapid Lines with Metro Rail. For example, Line 760 should extent further south to connect to Compton Station. This will alleviate over crowding on Line 60.